What's worth than a Red Dog? A warm Red Dog, that's what. Now, with the new Coastal Koozie, you're guaranteed to have a reserved seat to cool beer and soft-drinks at post-game gatherings. This insulated can and bottle holder is imprinted on two sides with the famous Pirate logo and also reminds your buddies who the reigning 2001 & 2002 Champions are. 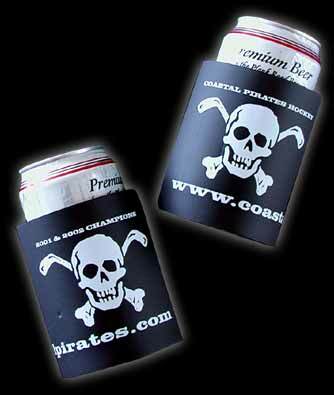 And, just in case you forget the web address after sipping too many PBRs, the Coastal Koozie also has the link to www.coastalpirates.com  the official home of Pirates Hockey  prominently displayed .